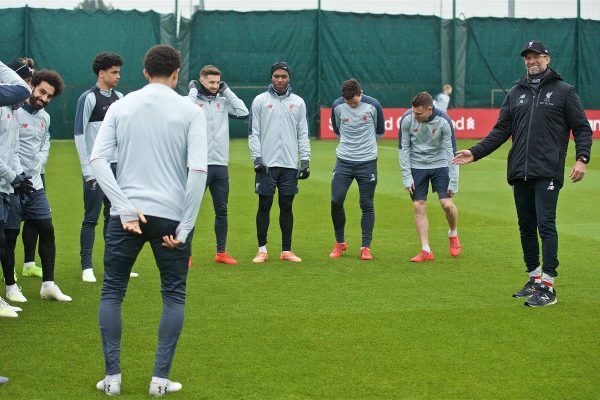 The midfield once again presents Jurgen Klopp’s selection dilemma ahead of Liverpool’s decisive Champions League quarter-final second-leg against Porto. The Reds arrive in Portugal with a healthy lead from the Anfield first leg, and Wednesday’s return is all about producing a professional display to see the job through. Liverpool’s continued excellent form with a consistent lineup means Klopp is unlikely to make many changes for a make-or-break night at Estadio do Dragao. However, minor switches could be made for a fixture in which the onus is not on the Reds to attack, but instead remain composed and defensively resolute. So how could the starting XI look for the second leg? Klopp has named a 21-man squad for the trip and the good news is that Jordan Henderson is included after an ankle injury concern. Joe Gomez is named in the travelling party after coming through an hour of the Liverpool U23s’ 6-0 win at Leicester on Sunday. So too is Adam Lallana, who is back to fitness after missing the last three games with a muscle problem. 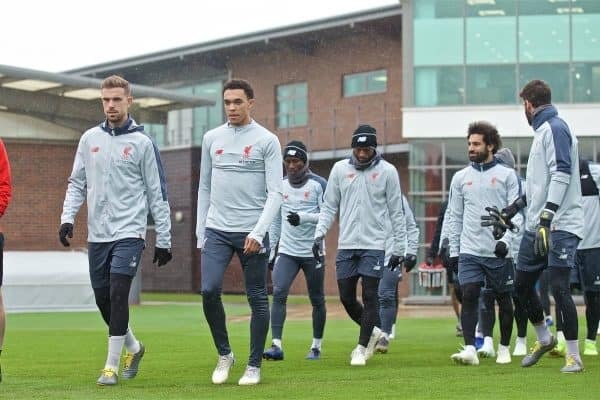 However, Dejan Lovren is left out due to illness and joins recovering duo Alex Oxlade-Chamberlain and Rhian Brewster as the only absentees. Andy Robertson is available after missing the first leg through suspension and will return to the lineup. As in the first leg, Klopp could conduct some light rotation, with this likely to come in midfield. 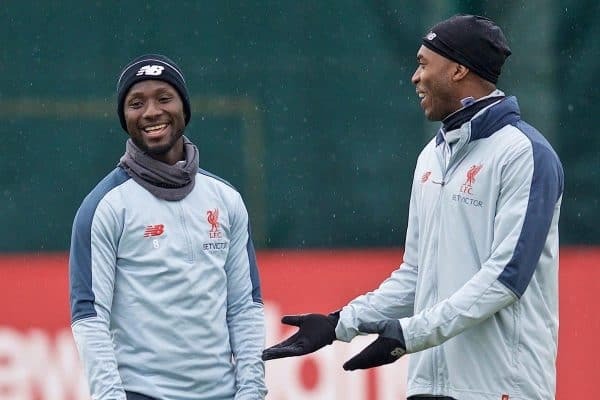 The new-look trio of Fabinho, Henderson and Naby Keita could continue for the third game running, but Gini Wijnaldum and James Milner offer fresh legs to introduce. Klopp could consider attacking changes given the Reds’ strong position in the tie, with Divock Origi, Daniel Sturridge and Xherdan Shaqiri all available. The Reds are in a commanding position in the tie but Klopp won’t take anything for granted by rotating heavily. A couple of minor adjustments should arrive, though, to keep things fresh. 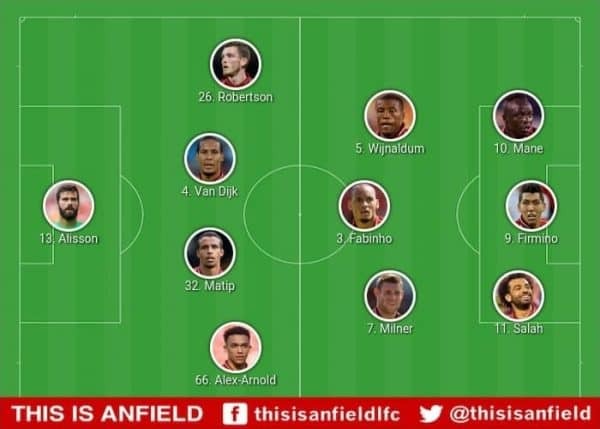 One of those will come in defence, where Robertson will return at left-back after he sat out the first leg. No further rotation is likely in the back four, with Lovren injured and Gomez potentially not yet ready to start such a high-profile fixture after his long spell out. With the attack picking itself, the only other area for adjustment is midfield. 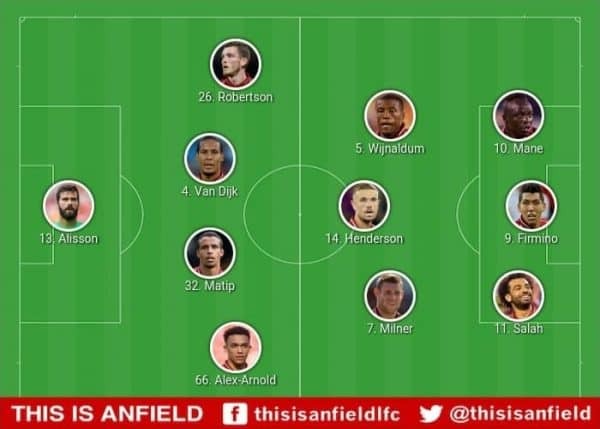 The nicely refreshed duo of Wijnaldum and Milner are the options to come in, and we could see both enter the starting XI to provide fresh legs. Klopp could conduct a straight swap of his box-to-box paring—withdrawing Keita after three quickfire starts along with Henderson, with one eye on preserving the captain’s fitness. The only question over the selection is which midfield combination the boss opts for. We all know that Klopp has a tried-and-trusted unit that he turns to for big games, especially away from Anfield. 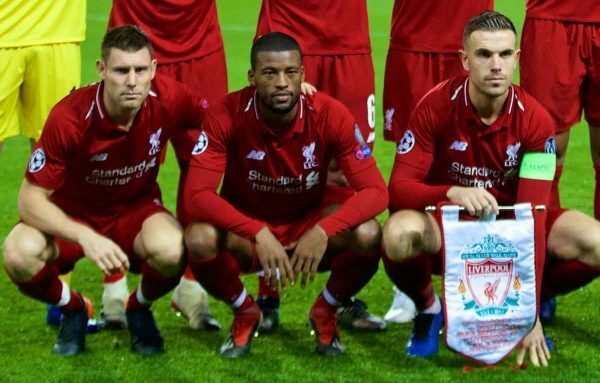 And it would not be a surprise to see the industrious Henderson-Wijnaldum-Milner triumvirate reformed as the Reds look for a solid performance to progress. That trio is not a popular pick, but it would be an understandable selection offering valuable experience to get through a crucial night. As always, the midfield presents the big dilemma for Klopp to solve and it will be interesting to see how the boss decides to play it. One thing for sure is that both possible options boast enough quality to do the job on the night and take the Reds through to the semi-finals.